Welcome to Day 2 of the Newton's Nook February Release! Today the new Beautiful Spring stamp and die set is being revealed. This is another set that is part of the Beautiful Swirls series which is inspired by the gorgeous swirls of paper quilling. Beautiful Blossoms and Beautiful Wings are part of this series, and I think they would all be gorgeous to mix and match with each other! 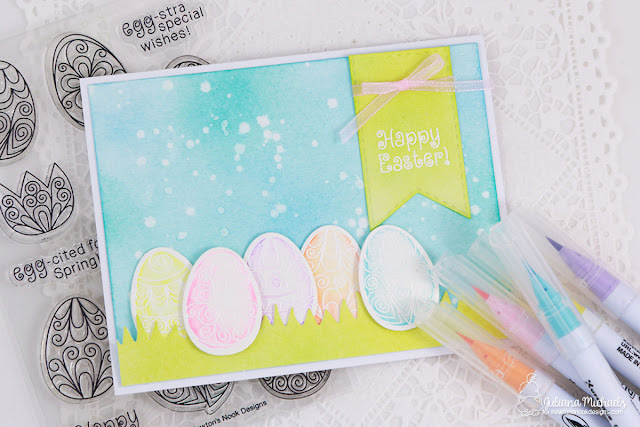 Make sure to keep reading to learn about the card I created and then how to enter for your chance to win the Beautiful Spring stamp set! This set screamed to be watercolored, and so I did just that to create a soft, pastel Easter card! For all the pieces of the card, I used watercolor paper. I find it works best with watercolor markers and is perfect for Distress Ink blending. I began by stamping all the images using Versamark Embossing Ink. I then sprinkled them with white embossing powder and heat set it using a heat gun. To color the eggs, I used Zig Clean Color Real Brush Markers in the following colors: Light Pink, Light Blue, Lilac, Lemon Yellow and Bright Yellow. I only added a bit of color to the edges and then used a water brush to blend the ink toward the center. I used the Ink Blending technique and Distress Ink in Salty Ocean to create the background. I then added some splatters of water. I did some color mixing with Distress Ink in Mustard Seed and Salty Ocean to create the green I used on the banner and grass. Speaking of grass, that die is a new die being released by Newton's Nook called Land Borders. And I love how it makes the perfect place for my little Easter eggs to sit! So, how would you like to win the “Beautiful Spring” Stamp Set? Love the watercolor! I NEED this set!! Amazing sweet card! Love the soft watercolor! What a lovely set---the eggs are so detailed, and this technique is just lovely. Love your soft and bright watercolor scene, gorgeous!! Beautiful colors, made with your zigmarkers! Love your card!! Cute card! The color palette is so perfect for Easter. Beautiful...LOVE the water colour look! Very pretty--I like the soft watercolor look. Your watercolored card is stunning! Love how you used the set! Lovely pastel spring card, I love this new set! Gorgeous card! 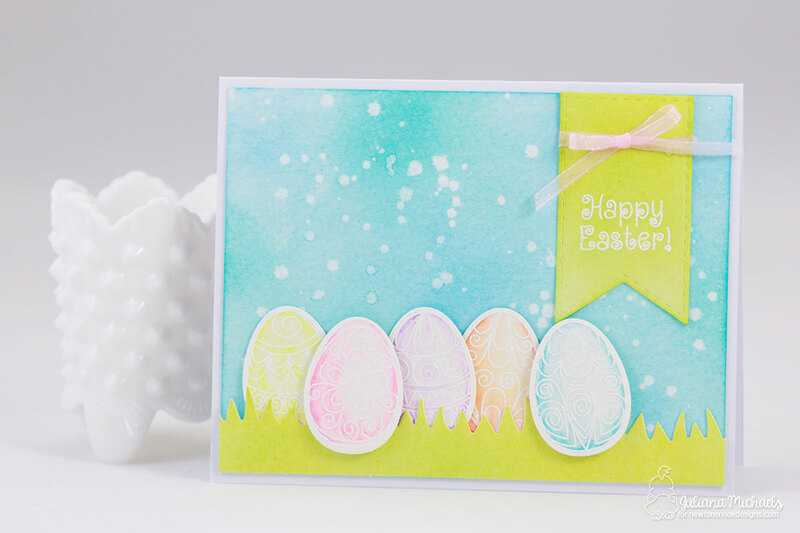 Love your coloring, and the ink-blended background showcases those pretty eggs perfectly! Very sweet card with very sweet colors! Love the colours Juliana. A sweet set! Beautiful colors on this lovely card! 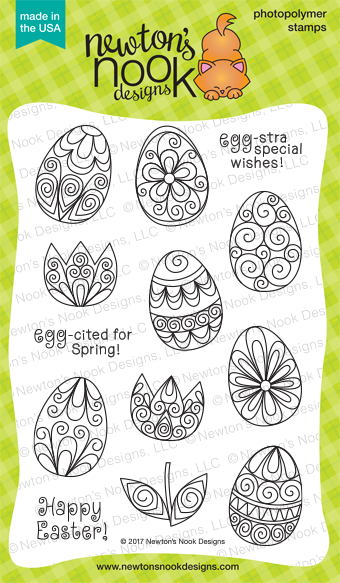 Love the designs in the eggs... such a pretty stamp set! Love the grass die too! Love the card. Simple and elegant. Cute card. Very beautiful stamps and dies. Wow! Love your gorgeous sweet card!!! Beautiful Spring Set is adorable!!! Love the soft spring colors! Beautiful card!!! Love your background and the pastel color of your eggs! Such a lovely card, soft pastels work well with this set too! Would you consider making a video creating your lovely background?! Pretty please! So gorgeous! I love the bright pastels!! Very beautiful card. Love the eggs, so delicate. 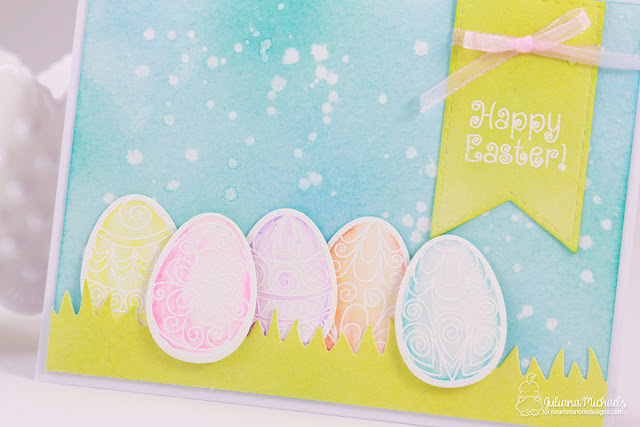 Love how you colored the eggs, very pretty and "eastery" in those pretty pastel colors.